of a pressure equal to 0.6 - 1.1 atmosphere (600 - 1100 g/cm2) at sea level (8.5 lbs/sq in - 15.6 lbs/sq in). the match is restarted by dropping the replacement ball at the place where the first ball became defective (see Decision 1). the match is restarted accordingly. The ball may not be changed during the match without the authority of the referee. the reference "INTERNATIONAL MATCHBALL STANDARD"
Such a designation on a football indicates that it has been tested officially and found to be in compliance with specific technical requirements, different for each category and additional to the minimum specifications stipulated in Law 2. The International F.A. Board must approve the list of the additional requirements specific to each of the respective categories. The institutes conducting the tests are subject to the approval of FIFA. Member association competitions may require the use of balls bearing any one of these three designations. In all other matches, the ball used must satisfy the requirements of Law 2. 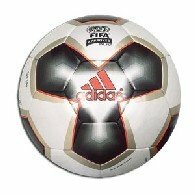 In FIFA competition matches and in competition matches organized under the auspices of the confederations and member associations, no kind of commercial advertising on the ball is permitted, except for the emblem of the competition, the competition organizer and the authorized trademark of the manufacturer. The competition regulations may restrict the size and number of such markings.